The Viking Supporters Co-operative is delighted to announce that following a successful application to Doncaster Council the Keepmoat Stadium and surrounding areas have been designated as an Asset of Community Value (ACV). The VSC made the application to Doncaster MBC to have the stadium and surrounding areas listed under the 2011 Localism Act. The process started in January 2014 and with the ACV now in place should the council decide to sell all or part of the stadium complex the VSC must be informed as the nominated community group. The VSC would then have a period of no more than six weeks to lodge a non-binding expression of interest, and then a further four and a half months to develop a bid and raise the necessary capital to purchase on behalf of the community. A number of football stadia have already been designated as ACVs, including Old Trafford, Anfield and Leicester City's King Power Stadium, and the Keepmoat Stadium now joins that growing list. The decision to support the application by Doncaster Council reflects the growing understanding that, as the Secretary of State, Eric Pickles said when launching the Localism Act in 2011, "Football stadiums are not only the heart and soul of every team, they are rooted in and loved by the neighbourhoods that surround them". In our view, this is fantastic news for Doncaster Rovers supporters in particular, but will also help ensure that the stadium area remains available for fans of all the Doncastrian sporting clubs who use the facilities. 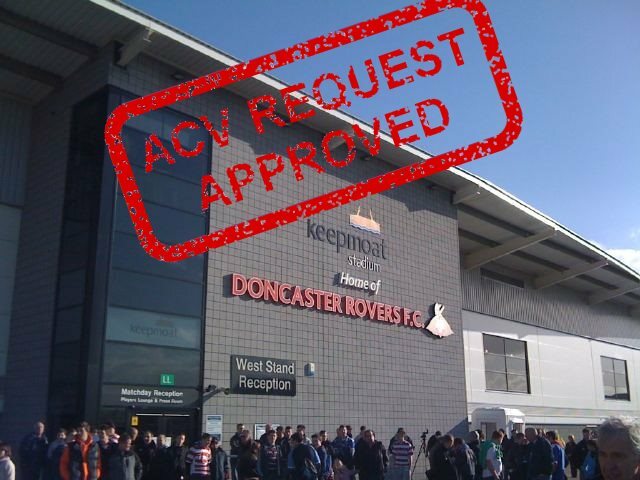 The Keepmoat stadium complex is vital for the continued development of those clubs and this ACV gives supporters and the wider Doncaster community a say in what happens should the council agree to sell it. The ACV listing remains in place for a period of 5 years and the VSC will commit to re-apply in 2019. The VSC would like to thank Doncaster Rovers Football Club, Supporters Direct, and Doncaster Council's Asset Management team for their assistance and support throughout the process. The application letter can be read here and the siteplan can be seen here.